According to the Hindu mythology, the literal translation of Vrat is a vow, but in context, it is a means to express devotion to the almighty God. And fasting is one of the auspicious rites that are an integral part of this concept, accompanied by holy chants and prayers. Traditionally, it is observed by women in order to ensure good health and prosperity for their loved ones, One of such religiously significant Vrats is Kokila Vrat associated with Goddess Parvati. It is marked on the full moon day of the holy month of Ashadha. Although, in some parts of the country it is believed that Kokila Vrat is observed only when the month of Ashadha falls during Adhik Maas. As per Hindu Panchang, this year the pious event of Kokila Vrat will be observed on Ashadha Purnima. As mentioned, Kokila Vrat is celebrated by women all across the country on Ashadha Purnima. It is believed that one who observes this auspicious day with utmost devotion will remain committed to her marriage forever. Nothing, not even death can do her apart. It is also said that women who fast during this period will be bestowed with prosperity, good fortune, wellness, and money. Kokila Vrat also holds great significance for an unmarried woman. It is believed that girls seeking good husband should observe the auspicious Vrat and pray to the idol of cuckoo bird to get the blessings from Goddess Parvati. It can help women get rid of various doshas like Bhauma Dosha that throw obstacles in their married life. In Hindu Mythology, the tradition of worship is not limited to deities and idols; it also includes trees, birds, and animals. Cow, in particular, is one such animal that is considered sacred because it is believed that the entire universe along with the three realms resides inside her. So, worshipping a cow during Kokila vrat is considered extremely important. On the day when the Vrat begins, women who are observing the Kokila vrat should wake up in the Brahmamuhurta, i.e. before the sunrise and get over with all the routine work as quickly as possible. She should bathe herself with a mixture of amla pulp and water. This ritual goes on for the next eight to ten days. The Vrat begins with worshipping the Lord Sun by using a thick chickpea flour paste followed by offering the first bread of the day to a cow. Then, an idol of Cuckoo bird is worshipped for the next eight days using haldi, chandan, roli, rice, and Gangajal. The Cuckoo bird here symbolizes Goddess Parvati. The devotee should continue with the fasting until the sunset and conclude it by listening to the Kokila Vrat story and if possible, after seeing a cuckoo bird. The woman must observe celibacy, maintain a calm state of mind and should not have negative or malicious thoughts for anyone this entire time. There was a king named Daksha Prajapati who was a devotee of Lord Vishnu. Once he organized a grand Hom and invited all the deities except for Shiva, who was married to one of his daughters named Sati. When she came to know about this mega event, she requested Shiva to let her go to her father’s place, and he agreed. But when she got there, she was heartbroken by the demeaning comments and insulting accusations that were imposed by her father on Shiva. She got so discomposed that she jumped into the fire of the Homa itself. When Shiva came across this news, he got infuriated and sent one of his avatar, Veerbhadra, to demolish the Havan and kill king Daksha. He was so angry that he even cursed Sati to be a Cuckoo bird for the next ten thousand years because she didn’t obey his orders. Sati reborn as Shailja and fasted the entire month of Ashadha to win back Lord Shiva as her husband. 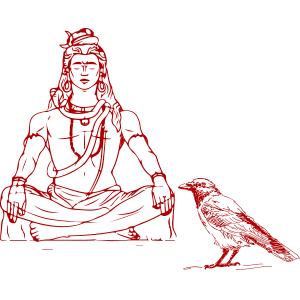 mPanchang enlists the entire list of Hindu Vrat and detailed description of Vrat Vidhis and Vrat Kathas. Here, you can get complete information on all Indian festivals.